Andy says: "Undefeated has been delivering the goods on the collaboration front for years. Of course, they were responsible for one of the most sought-after and expensive collabs of all time, but they&apos;ve taken a different approach lately. Their recent work with K-Swiss, Converse and Puma has been on the affordable side, and we&apos;re not complaining. The best of the bunch are the ripstop Clydes, which just dropped a few weeks ago for the very reasonable price of $65. Despite the fact that these are already flying out of most shops, we can do better than retail. 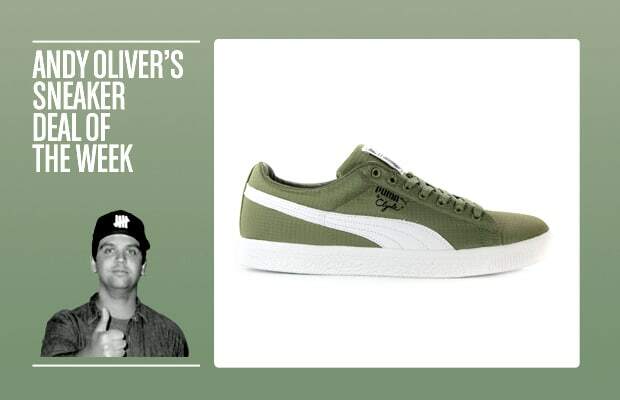 This week, you can grab the ripstop Puma Clydes from Karmaloop for just $52 with the promo code 20CLINTON. I can&apos;t imagine that you&apos;ll find these for cheaper, so start clicking!"